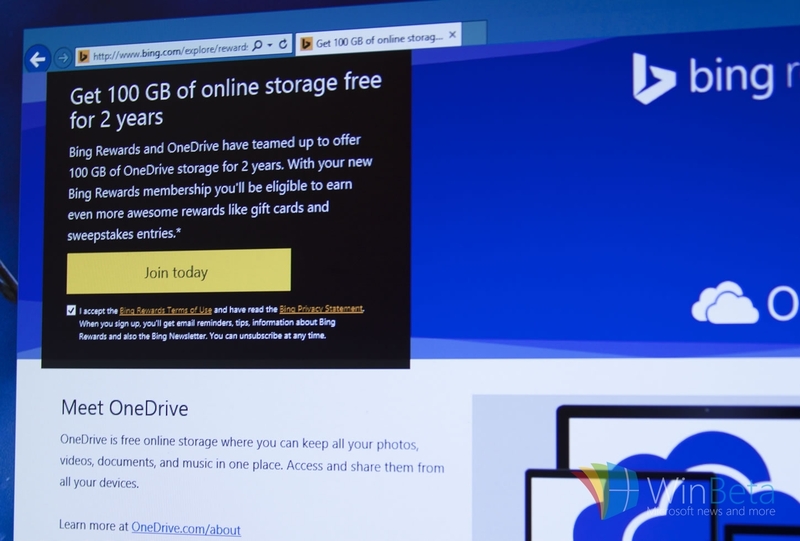 Microsoft is offering 100GB of free OneDrive storage for two years if you sign up for the Bing Rewards program. All you have to do is sign-into Bing and keep searching using Microsoft’s search engine to earn Bing Rewards credits. Consider it a “frequent flyer program” for Bing, allowing you to redeem credits you earn for searching and can be spent on gift cards, sweepstakes entries, and other goodies. New members receive 20 bonus credits just by signing up, getting you well on your way to earning enough credits for this new OneDrive offer in your first week. It’s easy to join today by visiting http://www.bingrewards.com and following the instructions to create a Bing Rewards account. Signing up for the program is a simple process of connecting your email address to Bing Rewards. Once you are signed up, you can begin searching Bing.com while logged in to earn credits. Head over to the VIA link below to claim your 100GB of free OneDrive storage as part of this promotion. Update: The offer is for 2 years. At the time of this post, Microsoft had yet to update the offer to indicate 2 years (it was still mentioning 1 year). Note: Bing Rewards is a program for US residents only. Bing Rewards is not available in any other country.